These are the most difficult to sort because of their similarities, and the least known of all large and small date varieties. They have always been held in low regard and remain unpublished in most guides because all of them seem rather easy to obtain. With no real premium value involved, very few people care to collect them by specific date size. 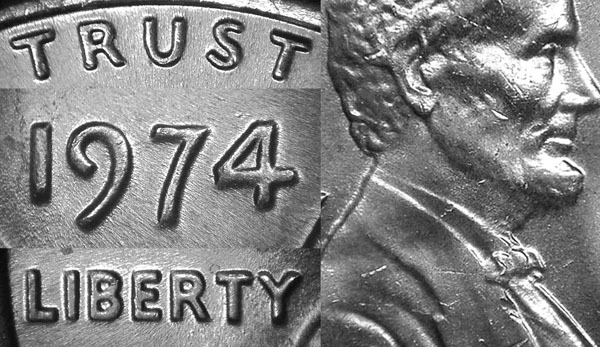 The large date and small date 1974 cents were probably created due to the proposed change-over to aluminum cents that year, although this theory has not been proven with mint records to my knowledge. For some time after their issue, the large date cents were mistaken for a distended hub doubled master die. This theory was proven wrong in 1980 with overlays. They have since been accepted as large/small date varieties - also known as type 1 (large) and type 2 (small). There are many differences between the two varieties, most of which are very subtle. The 7 is rounded at the top on the large date, pointed on the small date. The inside end of the 9 is rounded on the large date, and is squared off on the small date. The top of the 4 is wider on the large date than the small date. The bottom of both the 7 and 9 digits are much fatter on the large date. The entire date is closer to the rim on the large date. Use the distance of the 4 to the rim as a gauge. The motto is far closer to the rim on the large date. LIBERTY is closer to the rim on the large date. The throat and upper lip are more distinct on the large date. All the hair curls are sharper and more distinct on the large date. There are two spots I use in determining the difference between the two, and these two spots usually always work well for me - the top of the 7, where it is blunt and rounded on the large date, and sharp and bold on the small date is the first area. Second I turn to TRUST in the motto. If it nearly touches the rim, it's a large date. If it shows space to the rim, it's a small date. To date ALL known proof cents are large date. No small date proofs have ever been reported. This may help. 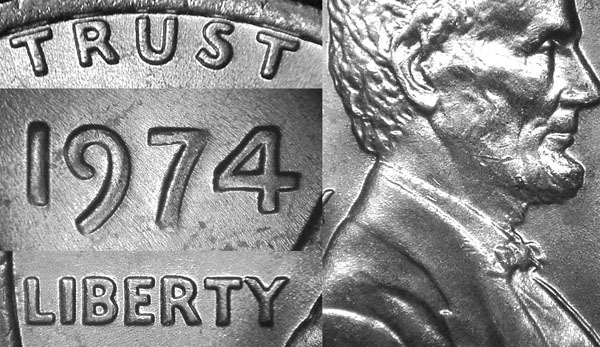 Another thing that may help with 1974S business strike cents is that all known examples of large date cents have the type 1 (earlier type) mintmark. 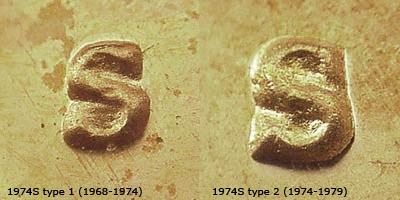 All small date examples known have the type 2 (later type) mintmark. This is only true with business strike S-mint cents The proof cents are known with both mintmarks.